Gorillas using iPads, lemurs finger painting, squirrel monkeys blowing bubbles...these primates are pretty smart! Could you make the grade in Primate School? 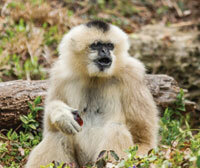 Learn how diverse the primate family is, and some of the ways humans are teaching new skills to their primate cousins. Author Jennifer Keats Curtis is once again working with organizations across the country to share fun facts about primates through this photo journal. Orangutans, apes, monkeys and gorillas have always fascinated me. When visiting the zoo, I spend a lot of time at the primate exhibits. I'm mesmerized by how "human" some primates behave. 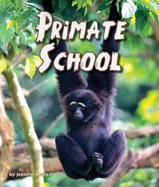 In Primate School, readers get a realistic view of different primate species. The pages are filled with engaging photos and interesting material. Children will learn what a primate is and their characteristics. Primate School also gives a glimpse of how zoos train and handle primates. The "For Creative Minds" section in the back of the book delves into Endangered Species, allows children to determine if a certain animal is a primate or not, gives a glimpse on what enrichment is offered to primates in the zoo, and briefs on chimpanzee sounds and calls. One person will win a book copy of Primate School. I like gorillas the best! They are so interesting to watch at Zoo Atlanta! I love orangutans. I fell in love with the huge male one at the Philadelphia zoo. He was making faces at my daughter is was so cute. Chimps are my favorite of these three. We love Orangutans, they look funny but can be soooo human like! Orangutans (only we call the orangatangs here in Redneckland)because they are always playful and cute when we see them at the Atlanta zoo.